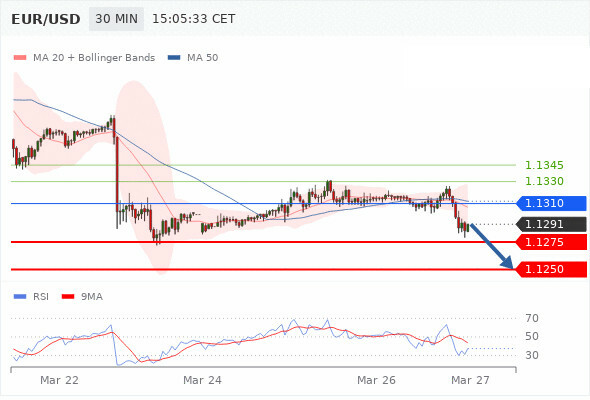 Technical Analysis and Forex tips 26th march 2019 that covers latest market news and daily shares trading signals from experts of the field. Our preference is for short positions below 1.1310 with targets at 1.1275 & 1.1250 in extension. Alternative scenario is above 1.1310 look for further upside with 1.1330 & 1.1345 as targets. Our preference is for long positions above 1.3195 with targets at 1.3270 & 1.3300 in extension. Alternative scenario is below 1.3195 look for further downside with 1.3170 & 1.3140 as targets. Our preference is for long positions above 0.9910 with targets at 0.9970 & 0.9985 in extension. Alternative scenario is below 0.9910 look for further downside with 0.9895 & 0.9870 as targets. Our preference is for long positions above 110.25 with targets at 110.80 & 110.95 in extension. Alternative scenario is below 110.25 look for further downside with 110.00 & 109.70 as targets. Our preference is for short positions below 1.3415 with targets at 1.3370 & 1.3345 in extension. Alternative scenario is above 1.3415 look for further upside with 1.3440 & 1.3470 as targets. Our preference is for long positions above 0.7115 with targets at 0.7155 & 0.7170 in extension. Alternative scenario is below 0.7115 look for further downside with 0.7100 & 0.7080 as targets.